A study led by Stanford Medicine researchers shows why so many mutations associated with hypertrophic cardiomyopathy, a heart disorder, alter a key constituent of muscle cells in a way that makes it work overtime. 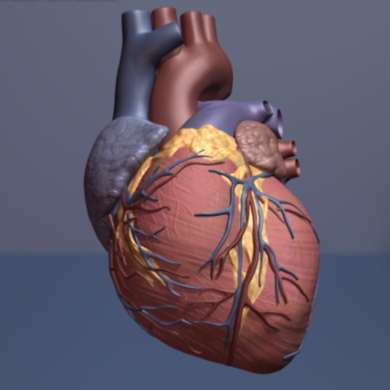 About 1 in every 500 people is born with hypertrophic cardiomyopathy, a genetic disease caused by any one of numerous mutations that, mysteriously, cause heart muscle to contract with too much force. You'd think that hypertrophic cardiomyopathy would make you a natural athlete. Instead, it can be lethal. "If you're carrying one of these mutations, it's as if you're out for a jog. The problem is, you're doing that 24 hours a day for your whole life," said James Spudich, Ph.D., professor of biochemistry at the School of Medicine. At some point, your heart begins to feel the effects, becoming swollen, then fibrotic, and eventually giving out. Now, researchers have discovered the mechanism behind this workaholic heart. The findings were reported in a paper published online Aug. 13 in the Proceedings of the National Academy of Sciences. Spudich is the senior author. Lead authorship is shared by Stanford postdoctoral scholars Darshan Trivedi, Ph.D., and Saswata Sarkar, Ph.D.; and by Robert Anderson, a researcher at MyoKardia, a company co-founded by Spudich. Spudich has spent decades studying, at the molecular level, how muscles contract—and, in particular, the workings of myosin, a key constituent of every muscle cell, including the ones composing heart muscle. Myosin is a protein and a hard-working little motor of sorts, whose dynamic action contributes to the overall contraction of a muscle. But it only works part-time, spending much of its existence in a posture akin to that of a sleeping flamingo, with its head tucked tightly into its torso. That's just as it should be, from the standpoint of optimal heart function. Like all proteins, myosin molecules are made up of amino acids. There are 20 different types of amino acids, each with its own biochemical quirks and distinctive shape. Spudich and his colleagues discovered that many mutations associated with hypertrophic cardiomyopathy, although they occur at different points along the myosin gene's sequence, often wind up affecting amino acids on the same surface of the folded protein's outer edge, altering the myosin molecule in ways that coax it out of its sleeping flamingo posture. The changed postural preference, in turn, keeps the myosin molecule from spending enough time snoozing on the job, collectively causing constant overdrive in the heart muscle's power output.